This blog will serve as an additional resource for information pertaining to what we're discussing/reading in my classes this year. It will not be subject specific, meaning it won't only be for English 3/4 or Spanish for Spanish Speaker...etc., and will therefore provide you with a myriad of perspectives and tidbits. As the title of the blog suggests, I'm interested in the literary lives we all share. Don't be afraid to put in your two cents(let that voice be heard!) and suggests topics for blog entries. I wanna know what you read about! Here's to a great year, chickadees! p.s. If you're here, don't forget you can get your class agenda, print out worksheets, and respond to discussion questions at school loop; which, you can find a link for on the right. Just want to let you know that in the next day or so I'll be updating this little ditty with the final assignments for the next two (and final) weeks of school. Be sure to check back for a reminder! Only 16 more days of school left! I apologize for the lack of agenda updates. You chickadees know the drill...come into class, check the agenda notebook for anything you have missed, and then finally take a look in the worksheet folder. Also, make sure to take a look at your grades on Aeries. They are updated almost every other day! ~How to read a comic. STAR testing is schedule for this week. Be sure to check the testing bell schedule to ensure your presence at the appropriate time and place. 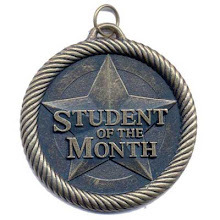 Who's going to be our next student of the month?